PORTLAND, Ore. – Amazon has issued recalls for solar eclipse glasses, sending hopeful eclipse-watchers into panic as eclipse glasses prices skyrocket, and stunning sellers who say their products are verified safe. Millions of people are planning to watch the total solar eclipse on August 21, planning elaborate vacations in the path of totality and ordering special glasses that let viewers look at the sun without damaging their eyes. More than 1 million people are expected to travel to Oregon to see the eclipse start its journey during the first total eclipse to cut through the continental U.S. from the west to east coast since 1918. But many are now scrambling to find new eclipse glasses after Amazon issued a widespread recall starting early Saturday morning amid reports of counterfeiters. Retailers who say they sell verified, NASA and American Astronomical Society-approved eclipse glasses are also caught in the recall, losing record profits with one week to go before the astronomical event. The American Astronomical Society said while Amazon recalled some counterfeit products, they also recalled legitimate dealers and manufacturers. 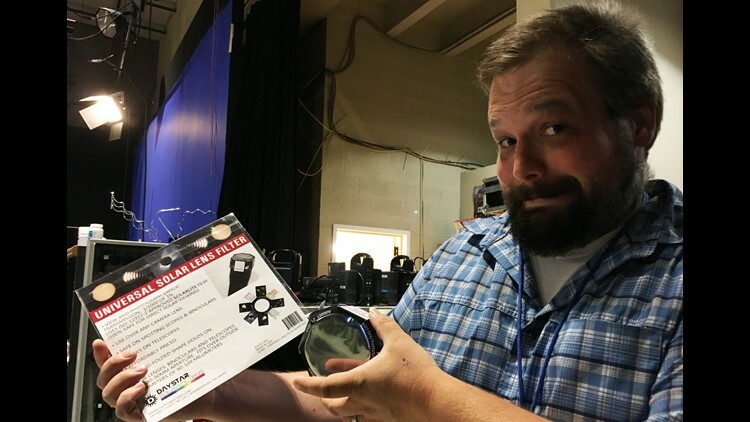 On Saturday, KGW’s photography staff received an email from Amazon, explaining the solar camera filters the station purchased for the Aug. 21 total solar eclipse were not confirmed safe for viewing. The lens caps had the proper ISO number, 12312-2, which has been verified to comply with international safety standards, and it was manufactured by a NASA and AAS-approved company. Amazon on Saturday said the supplier could not confirm the item came from a recommended manufacturer. “We recommend that you DO NOT use this product to view the sun or the eclipse,” Amazon wrote. At least a dozen KGW viewers said they received recall notices from Amazon Saturday. Portland resident Dan Fellini bought a pack of four solar eclipse glasses with his wife and a friend. “Just last night we were talking about the glasses, and thinking maybe we shouldn't trust them, even though the Amazon page made it fairly clear they were legit,” he said. At 2:05 a.m. Fellini received a recall email from Amazon. Another Portland resident, Will Clark, bought eclipse glasses billed as “CE and ISO tested, safe solar viewing.” He received a recall email Saturday morning at 7:28 a.m.
KGW viewer Heather Andersen said she bought two separate sets of solar glasses and learned both were not verified. “I give up,” she said. Ann Coombs wrote to KGW and said she bought glasses on July 5 so she wouldn't have to scramble to find them before the eclipse. She received a recall notice on Monday, Aug. 14. "With only a week to go it is very frustrating to find that all your good planning was for nothing," she said. Verified-safe eclipse glasses on Amazon are now heavily marked up with some going for hundreds of dollars. Purchasers also run the risk of not receiving them before Aug. 21. Amazon is issuing full refunds. An Amazon spokesperson said Amazon is responding "out of an abundance of caution" after reports of counterfeit products. "Safety is among our highest priorities. Out of an abundance of caution, we have proactively reached out to customers and provided refunds for eclipse glasses that may not comply with industry standards. We want customers to buy with confidence anytime they make a purchase on Amazon.com and eclipse glasses sold on Amazon.com are required to comply with the relevant ISO standard," the company said in a statement. Amazon said customers who did not receive an email purchased glasses that were safe to use. The company did not reveal how many glasses were recalled or how much money was refunded. 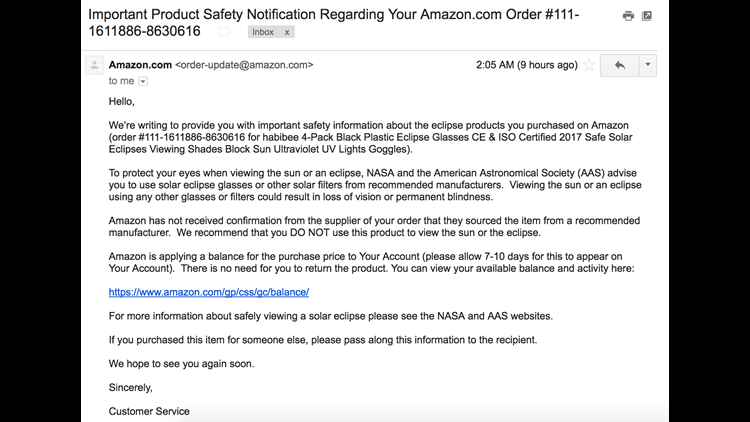 Anyone who is concerned about their eclipse glasses but did not receive an email about the recall can reach out to Amazon customer service. Amazon suggested customers refer to the NASA and AAS websites for more information about safely viewing the solar eclipse. The press officer for AAS said Amazon responded to counterfeit reports by shutting legitimate retailers out. "Amazon appears to have let just about anybody sell 'eclipse glasses' and other types of solar viewers on Amazon.com without taking steps to ensure that all such products meet the ISO 12312-2 international safety standard for filters for direct observation of the sun," said AAS spokesman Dr. Richard Tresh Fienberg. Fienberg said once AAS realized that was happening, it created a list of authorized dealers and manufacturers so the public would know who to trust. But Amazon's widespread recall included some legitimate companies anyway. "Now Amazon.com has made the problem worse by contacting customers who bought safe filters from reputable vendors as well as customers who bought possibly unsafe filters from questionable vendors and telling them all the same thing: don’t use the viewers to look at the sun, and we’ll refund your money," he said. "We don’t understand why Amazon isn’t being more careful about who they contact — we’ve explained to Amazon the difference between genuine solar viewers and counterfeits, and we’ve told them about our online list of reputable vendors of ISO-compliant safe products. Instead of going after the bad guys they appear to be covering their backside and saying that no vendors can be trusted. This is hurting legitimate companies’ reputations and potentially costing them a lot of money. It has caused mass confusion within the eclipse-chasing community and the public more generally." Fienberg said AAS is trying to work with Amazon to fix the issue but said, "so far we have not gotten a satisfactory response." While Amazon said it responded out of caution, some sellers say their products are approved by NASA and AAS, but still were subject to the recall. That sent some companies into economic turmoil in what was shaping up to be one of their most profitable months ever. KGW's solar filters came from a company called ICSTARS and manufactured by Thousand Oaks Optical, a NASA- and AAS-approved company. KGW also purchased the same filters from the photography company B&H, although B&H never issued a similar recall. On Monday, KGW received an email from ICSTARS, reiterating that the filters were safe. Furthermore, ICSTARS said Amazon never contacted them to verify the safety of the filters. "Amazon has rejected attempts by Daystar or ICSTARS to submit documentation to them," the company wrote. "We do have documentation for this fact." Jen Winter, the owner of the company, called KGW Monday to reiterate that the lenses are safe. She said she's attempted to reach out to every customer impacted by the recall but many have email blocks in place. "This has been very difficult for us," she said. "There's millions of dollars in inventory that our tiny little industry has put into this. It's an enormous financial loss." Winter said she worries about people who may now be left viewing the eclipse without any protection. "The danger in having no filter is much greater now. We could have people who are hurt because they were told the filter was not safe, and use no filter," she said. Two other U.S.-based Amazon solar eclipse glasses sellers contacted KGW following Amazon's recall. Both said their products were verified as safe and manufactured by companies approved by NASA, but their glasses are still under a recall. Manish Panjwani's Los Angeles-based astronomy product business, AgenaAstro, has sold three times its average monthly revenue in the past month. Ninety-five percent is related to the solar eclipse. He hired seven extra temporary workers just to help with the pre-eclipse boom. Panjwani's eclipse glasses come from two NASA-approved sellers: Thousand Oaks Optical in Arizona and Baader Planetarium in Germany. He said he provided documentation to Amazon proving the products' authenticity weeks ago, with no response from Amazon. On Saturday morning, he woke up to 100 emails from customers after Amazon issued a recall for his products. "People have some of the best glasses in the world in their hands right now and they don't believe in that product," he said. "They're out there looking for something inferior." Panjwani said Amazon is temporarily retaining some of his profits because of the recall. He also has nearly 5,000 glasses at an Amazon warehouse, which customers can no longer purchase. "That's just sitting there. I cannot sell it and I cannot get it back in time for the eclipse," he said. “Due to the evolving circumstances around Eclipse glasses, it’s important that you have funds available to address customer returns. We will be holding back a portion of your funds from prior sales of Eclipse glasses and will continue to evaluate the need to hold a reserve for these funds. As we learn more about the safety concerns related to Eclipse glasses, we'll assess changes regarding your disbursement reserve balance." A second eclipse glasses seller based in Tucson, Ariz., Lunt Solar System, said their products are also verified but under a recall anyway. Amazon did not respond to KGW's specific questions about the sellers. "Customers may have purchased counterfeit versions of legitimate products," an Amazon spokesperson said when asked about the issue.